NEW: New York's attorney general says Garner's case has spiked a "crisis of confidence"
Witnessing protests in your city? Share your photos with CNN iReport. 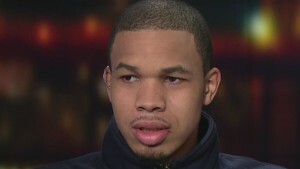 (CNN) -- Before the Brooklyn Nets and Cleveland Cavaliers faced off on the basketball court Monday night, several players were already scoring points with protesters outside the arena. 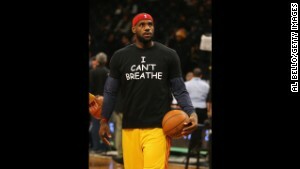 As they warmed up for the game, Cleveland Cavaliers LeBron James and Kyrie Irving were among the players wearing T-shirts that said "I can't breathe" -- Eric Garner's last words, which have become a rallying cry for protesters after last week's grand jury decision not to indict an officer in his death. Outside the Barclays Center, a large crowd of demonstrators swarmed the streets, chanting "hands up, don't shoot" and "black lives matter." The crowd erupted in cheers after an organizer told them about the players' T-shirts. The NBA players' show of support for protesters comes a week after five players from the St. Louis Rams walked onto the field and raised their palms in the air, demonstrating the "hands up, don't shoot" gesture that protesters have been using in demonstrations over the police shooting of Michael Brown in Ferguson, Missouri. Activists have been threatening to disrupt the visit of the Duke and Duchess of Cambridge, who are visiting New York and attending the Nets-Cavaliers game. "They need to know this is what America is. ... America is a system where those who benefit from others neglect to see the underclass, the people who are underprivileged, and that's why we're out here," said Jibri Nuriddin, a protester from New York. Demonstrations, he said, aren't going to stop. Federal response needed in Garner death? "We're going to keep chanting and keep marching," he told CNN from outside the arena. "Everyone's going to know that this is an issue. We're not going to let this issue die." Amanda Jack, a public defender in New York, said she joined protests after seeing many of her clients suffer at the hands of what she called a racist system. "There can't be any more business as usual when this kind of injustice continues. I think this (basketball game) is one of the examples of consumerism and excess, so it's time. Shut it down," she said. "We've got to address our broken justice system." 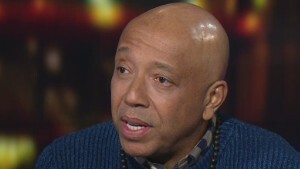 Brooklyn Borough President Eric Adams, a former New York police officer, said protesters have a right to take a stand. "There's nothing more American than having the right to voice your concern," he told CNN's "The Situation Room." "We want them to be constructive and not destructive." The New York demonstration was one of a number of protests across the United States Monday night, days after a grand jury in New York City decided not to indict a police officer in Eric Garner's death and two weeks after a Missouri grand jury decided not to indict former Officer Darren Wilson in Brown's killing. 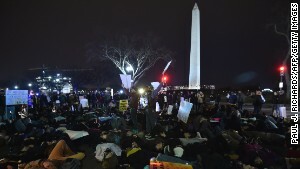 In Washington, demonstrators protesting police violence laid down in the street several blocks from the White House on Monday, blocking rush hour traffic. Protesters chanted, "black lives matter" and "off the sidewalks, into the streets." One woman held a sign that said, "Stop killing us." The demonstration blocked traffic at cross streets along Connecticut Avenue, a major thoroughfare that connects the White House to upper northwest Washington. Collette Flanagan of Dallas told protesters her unarmed son was killed by police. "Our babies should be here in the prime of their lives," she said. And Berkeley, California, protestors temporarily shut down the I-80 freeway in both directions Monday night. New York Mayor Bill de Blasio praised police officers' handling of the protests. "They've respected people's right under the First Amendment to express their views. They've kept the peace. They've kept order," he told reporters Monday. "We had only a handful arrests the last two days, which is extraordinarily impressive given all of the activity that's happening." De Blasio says he understands parents who are worried about what might happen if their kids encounter police. The New York mayor says he's had to warn his own son about that possibility. "When he was just becoming a teenager, you know, the conversation was a difficult one and a complicated one, because you're trying to say to a young person who obviously looks up to police, you know, be careful and be smart and respect the police, but also recognize that there are these realities to be grappled with -- and that's a tough conversation to have with a young man," he said. De Blasio is white. His son is biracial. "This is a national reality. It's not just a New York reality," de Blasio said. "And that, unfortunately, is further evidence of how much more we all have to learn from each other. ... The goal is to get to a day when no parent feels they have to have that conversation." A day after a heated standoff on a freeway between protesters in Oakland, California, and the California Highway Patrol, demonstrators in the area took to the streets again Monday. CNN affiliate KTVU showed throngs of protesters in the streets in Berkeley, California. 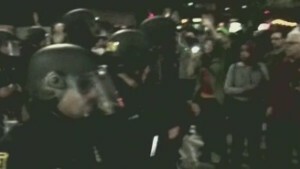 It was a peaceful scene, KTVU reported. But violence erupted in earlier Berkeley protests Monday. Some protesters looted and vandalized businesses, police spokeswoman Jennifer Coats said. One protester was struck in the head with a hammer when he tried to keep fellow protesters from damaging and looting a Radio Shack, she said. The man was hospitalized, but his injuries are not believed to be life-threatening. Two Berkeley officers also suffered minor injuries. Coats said five people were arrested, but she did not know the charges. On Sunday night, demonstrators flooded a highway in Oakland, California. Some threw explosives, bottles and rocks at officers, authorities said. Officers responded by deploying gas and arresting eight protesters. In the end, two officers suffered minor injuries. Police said five patrol cars were damaged. In Imperial, Missouri, demonstrators staged a different kind of protest Sunday. They burned St. Louis Rams football jerseys after the protest by players last week, CNN affiliate KSDK reported. "Why would you do something like that? It's utterly ridiculous," said Larry Magee. "I think the Rams ought to pack their bags, and I'll give them a plane ticket back to L.A."
Garner's daughter Erica said she was deeply moved by the diversity of protesters who have demonstrated across the country. "This is not a black-and-white issue. This is a national crisis," Erica Garner said. U.S. Attorney General Eric Holder has announced a federal civil rights investigation into Garner's death. And on Monday, New York Attorney General Eric Schneiderman said he was asking the state's governor to issue an executive order to change the way the state reviews cases such as Garner's. The order, Schneiderman's office said in a statement, should direct the attorney general "to investigate and, if necessary, prosecute cases involving unarmed civilians killed by police officers." "The horrible events surrounding the death of Eric Garner have revealed a deep crisis of confidence in some of the fundamental elements of our criminal justice system," Schneiderman said. 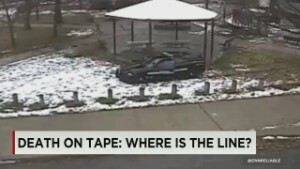 Unlike with the Michael Brown case, a video showing the moments leading up to Garner's death has been widely circulated. Erica Garner says that video has struck a nerve with many. "For white people to come out and show how deeply they was hurt and like Asians and, you know, different people from different nations and different parts of the world to come out and show that they felt the same way I felt on that video, I greatly appreciated it. It's like a sense of I'm not the only one that feels this way." This story was based on reporting by Julian Cummings, Athena Jones, Joe Sutton, Holly Yan, Dan Simon, Stephanie Gallman, Wayne Sterling, Laura Ly, Daniel Verello and Deborah Feyerick and was written by Catherine E. Shoichet, Holly Yan and Ralph Ellis.